Summary: Grace and Ted Chapman are widely regarded as the perfect literary power couple. Ted is a successful novelist and Grace, his wife of twenty years, is beautiful, stylish, carefree, and a wonderful homemaker. But what no one sees, what is churning under the surface, is Ted’s rages. His mood swings. And the precarious house of cards that their lifestyle is built upon. When Ted’s longtime assistant and mainstay leaves, the house of cards begins to crumble and Grace, with dark secrets in her past, is most vulnerable. She finds herself in need of help but with no one to turn to…until the perfect new assistant shows up out of the blue. To the rescue comes Beth, a competent young woman who can handle Ted and has the calm efficiency to weather the storms that threaten to engulf the Chapman household. Soon, though, it’s clear to Grace that Beth might be too good to be true. This new interloper might be the biggest threat of all, one that could cost Grace her marriage, her reputation, and even her sanity. With everything at stake and no one to confide in, Grace must find a way to save herself before it is too late. I have been a huge fan of Jane Green for years! I have adored many of her books, and I love that they can both make me laugh and make me cry. Her sixteenth and latest novel SAVING GRACE is another story that can't help but touch readers' hearts. SAVING GRACE tells the story of Grace Chapman, a woman who seemingly has it all. She has been married to Ted, a successful writer, for 20 years; and they are quite the power couple. However, Ted has a dark side that Grace is all too aware of. He has major mood swings and Grace will do almost anything to keep the peace. When Ted's stable assistant leaves, he becomes even more volatile. Grace doesn't have the skills to manage Ted's career and their house which makes him even more frustrated. When she hires Beth to become his assistant, she believes that's the answer -- maybe (just maybe) Ted will be happier. However, Beth isn't what she seems, and Grace's learns that Beth might ultimately destroy everything in Grace's life. 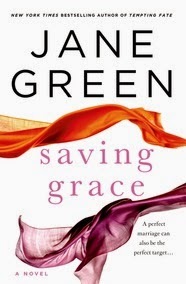 I was really excited to read SAVING GRACE -- first because I have enjoyed so many of Jane Green's novels, and second because the premise sounded terrific. I have to admit that, while I did enjoy much of this story, it wasn't my all-time favorite Jane Green novel...although that would really be saying something. There is no doubt that I enjoyed this "twisted" story and my heart really did go out to Grace, but I just didn't love this story like I had hoped. Having said that, SAVING GRACE is an intriguing story with some great characters. I really liked Grace and I was definitely rooting for her. I found the portrayal of her relationship with her husband to be very well written, and I do think many women will relate to her story. Personally, I was impressed that I was able to relate to Grace despite not having anything even remotely similar happen to me. Overall, Ms. Green did a great job in making Grace a realistic character that I cared about. And then there's Beth. I can't say I liked her character one bit, but I did find her interesting... in a twisted way. She was horrible and conniving, and it was fun to see Ms. Green write about such a despicable person. I felt similarly about Ted's character although I did feel as if he were a bit one dimensional. One thing I really appreciated about this novel was how it explored mental illness. As Grace begins to "lose her mind," it wasn't difficult to see how some one's life can be turned upside down so quickly. SAVING GRACE really make me think about mental illness and ultimately treatments, and what our family would do if facing a similar situation. I also really liked a few "minor" things about this novel including the themes of friendship and cooking. There are lots of delicious sounding recipes in the novel -- I have no doubt Jane Green is a wonderful hostess! In addition, I love that this novel, and all of the author's novels, have recurring themes of friendship and sisterhood. It would be a Jane Green book if it weren't ideal for book clubs, and of course, SAVING GRACE is perfect for a discussion. There is a reading guide available with twelve thought-provoking questions. Some of the themes you might want to explore include marriage, adultery, mental illness, treatments, diagnoses, intuition, and friendship. SAVING GRACE is an interesting novel about what can happen when a woman's world falls apart. Recommended for fans of Jane Green and women's fiction. Thanks to Sarah Hall Productions for a copy of this novel. I've only read one of Green's novels but I really liked the way she wrote about real life issues. I have a feeling I'd like this book too. I'm still reading this one ... and enjoying it. I haven't read this one yet, but it is sitting on my shelf and I'm hoping to get to it soon! I definitely liked this one as well. I think that I have yet to meet a Jane Green novel that I didn't like! I've liked all of Green's books so far and this one sounds good too.